Alexander Gordon Smith, 32, is best known as the author of the Escape From Furnace Series, made up of Lockdown, Solitary, Death Sentence, Fugitivesand Execution. He also wrote The Inventors - which was runner-up in the national Wow Factor Award - and The Inventors and the City of Stolen Souls, both of which were co-authored by his eleven-year-old brother Jamie. The first novel in his third series, The Fury, will be published in 2012, alongside an as yet untitled book for younger readers. He is the author of two creative writing handbooks, Inspired Creative Writing and Writing Bestselling Children�s Books, a number of screenplays that are currently in development, several non-fiction books and hundreds of short stories and articles. 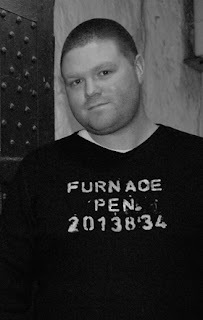 Gordon is the founder of Egg Box Publishing, an independent, non-profit imprint designed to publish and promote talented new writers and poets, and is the co-owner of Fear Driven Films, a production company filming its first feature in 2011. He is also the founder of Inkling Studios, a brand new venture which specialises in creating books, films, television programmes and computer games for children and young adults. He actively encourages people of all ages to read and write, and runs creative writing talks and workshops across the world. In 2009 he was named by the Courvoisier Future 500 as one of the most promising young entrepreneurs in the United Kingdom. He is called Gordon, rather than Alexander, because his Mum and Dad liked the name Gordon but didn't want his initials to spell GAS, so called him by his middle name. Click the Banner to see the rest of the Tour! Cal, Brick and Daisy are three ordinary teenagers whose lives suddenly take a terrifying turn for the worse. They begin to trigger a reaction in everybody they meet, one that makes friends and strangers alike turn rabid whenever they are close. One that makes people want to tear them to pieces. Cal and the other victims of the Fury - the ones that survive - manage to locate each other. But just when they think they have found a safe haven, a place to hide from the world, things get worse. They must fight to uncover the truth about the Fury before it is too late. But it is a truth that will destroy everything they know about life and death. The writing style of Alexander Gordon Smith is very unique in the sense that he knows just how to tap into his readers’ imagination and give them a story that will resonate long after they have read his book. This is certainly the case with The Fury. What makes The Fury so unique is that it builds a story that everyone can fear. Alexander turns the people you love the most against you. This book falls in the zombie genre and is unlike anything ever before. Mixed-in with his own twisted imagination that will have you fearing the things that goes on in his head, he takes such a gore-filled story and turns it into a beautifully written piece of literature. The effort he puts into the details is unparalleled as readers are presented with a new perspective on zombies that is beyond imagination. Every move in the book is comprehensively measured right down to the characters. Just like with the story, there is careful thought and consideration that were invested into the character. They are are fully laced with personality and are wonderfully sculptured that will have readers backing them throughout. This is the first book in a two-part series. Although it is expected to have more questions than answers when the book ends, it definitely leaves readers yearning for more. Alexander Gordon Smith is quickly become one of those authors that readers will pick up no matter what he writes because they know they are guaranteed to have an amazing story. Thank you Gordon for making this giveaway possible. 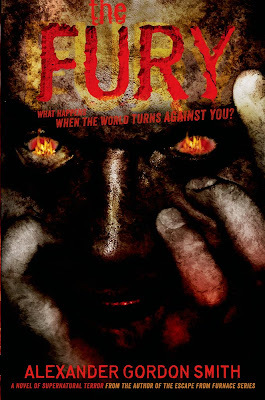 1 Winner will receive a Copy of The Fury by Alexander Gordon Smith. This sounds really good! I checked it out on amazon and it's in my wish list. I LOVE books like this. I will def be getting it if I'm not lucky enough to win one, thanks! !